1. Preheat the oven to 200°C, gas mark 6. Halve the squash lengthways, scoop out the seeds, then put the squash cut-side up in a roasting tray. Drizzle with the oil, season and roast for 30 minutes. 2. Meanwhile, prepare the stuffing. Melt half the butter or dairy-free spread in a large saucepan and sweat the onion over a low heat for 8 minutes. Add the garlic, cook for 2 minutes, then stir in the rice and stock. Bring to the boil and simmer, covered, over a low heat for 25 minutes, adding a little more stock if it starts to look dry. 3. Melt the remaining butter or dairy-free spread in a frying pan. Add the orange zest, dried fruit and pistachios. Cook, stirring, for 2-3 minutes until golden. Add the orange juice; simmer till most of the liquid has evaporated. Fold into the cooked rice with the pomegranate seeds, parsley and lemon juice. 4. Spoon the pilaf into the squash cavities, piling it high. 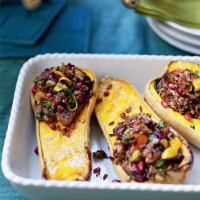 Bake for 25-30 minutes, until the squash flesh is tender and the pilaf is golden and crisp on top. Alternatively, let the pilaf cool completely; stuff the squash, cover and chill for up to 1 day. Reheat at 180˚C, gas mark 4 for 45-60 minutes. This recipe was first published in Mon Dec 05 10:26:00 GMT 2011.